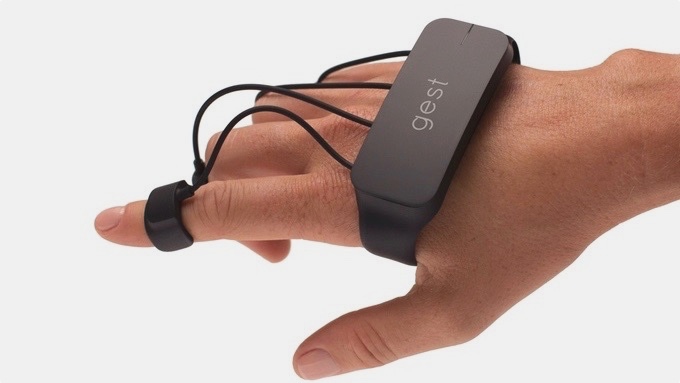 Gest is a wearable device that straps to you hand and fingers and replaces the gestures, taps, and swipes you traditional perform on a touch screen device. Outfitted with 15 sensors, the glove is designed to allow the user to interact with a mobile device or computer without the need of a keyboard and mouse. The company behind this wearable controller is seeking $100,000 in crowdfunding for Gest and is offering the digital toolkit to developers and early adopters until the Kickstarter campaign ends. The device has one palm strap, plus four finger connectors, each one linked to the strap by wires. The sensors in each of the finger connectors have a latency of approximately 40 – 60 ms for higher accuracy. It supports Bluetooth connectivity, has LED status indicators, and a rechargeable battery that the company says, will last through a full day of work. The controller is designed to learn how the user performs gestures like swiping, pointing, flicking, and grabbing. You can also customize your own gestures for additional controller support. It uses accelerometer, gyroscopes, and magnetometers to determine your finger positions. The company claims that the statistical model used in the device makes it "the most accurate gestural interface on the market today." The company designed the Gest for graphic designers using such programs as Photoshop for imaging, or AutoCAD for 3D modeling. However, it is also targeting the virtual reality industry. The company hopes to fill a niche in the VR market with a controller that you don't even have to hold in your hand because it is just connected to you. The Gest is also equipped with an API and raw sensor data that users can access for hand position and movement information to create compatible applications themselves. When two controllers are connected, one on each hand, they act as a replacement for typing. One video demonstration shows how users can simply tap on a desktop in the same way they would touch type on a keyboard, only there are no keys. This project is rough around the edges and is clearly not ready for consumer use just yet. However, a wireless controller that works with a variety of devices using precision accuracy and low-latency has a lot of potential. For $149, you can pledge the early bird tier on Kickstarter, which is one Gest controller in the hand position of your choice (right or left). For $299, you can pledge the duo tier for a pair of controllers. Shipping is expected for November of 2016.